On HBO’s critically acclaimed and thoroughly beloved TV show, Insecure, the hilarious Yvonne Orji plays Issa’s ultra-successful best friend, Molly Carter. Throughout the first season — which is available today on Blu-ray and DVD — we watch Molly reign as a powerful lawyer with an incredible apartment and killer wardrobe, all while navigating her workplace as a black woman, majorly failing in her dating life, and being half of one of the realest, funniest, and most moving female friendships on television. 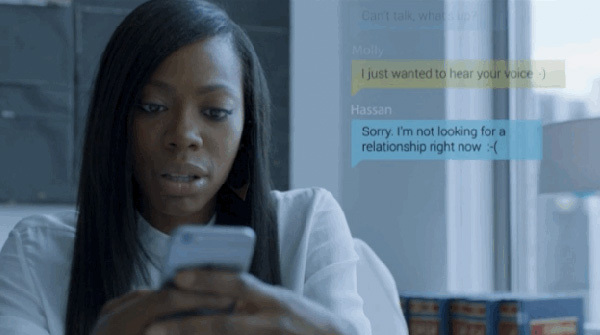 Orji brilliantly portrays the complex character as she self-sabotages relationships and downloads dating app after dating app. We get to laugh as she and Issa crack each other up, and witness the complicated beauty of their friendship when she and Issa argue, call each other out, and stand by each other regardless of their frustration. Aside from her riveting work on Insecure, the Nigerian-American actress plays Stacy on Jane the Virgin, is a stand-up comedian, and is the creator of the web series, First Gen.
We got to talk to Yvonne over the phone about mental health, Molly’s painfully relatable dating struggles, what we might see in the upcoming second season of Insecure, and more! HelloGiggles: The fight between Molly and Issa at the end of the first season is sparked when Issa suggests that Molly try therapy. Can you talk about how this stigma around mental health (which obviously exists in real life too) plays a role in Molly’s struggles on the show? 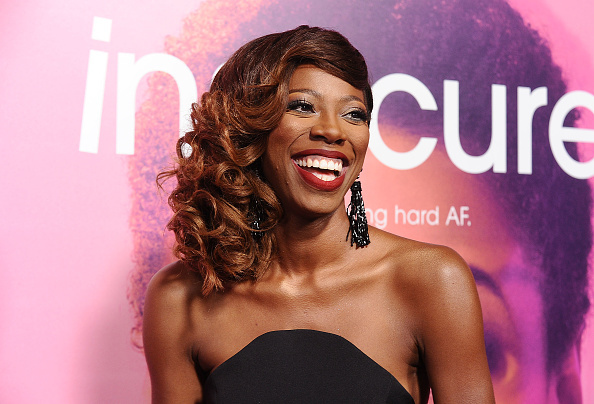 Yvonne Orji: Mental health — especially in the black community — is not something we speak up about. A lot of black people are like, “Nah, we don’t need therapy, we go to church”…which is still equally important, but at the same time, there are actual people who have degrees in deciphering what exactly your issues might be, and helping you to get to a place of closure or growth…I think highlighting that shows that, hey, therapy is not a bad thing. I think we showed both sides. We highlighted how there are so many ways to feel about it — like when Molly says [a therapist is] a fake friend you have to pay for. Like, who wants to go broke doing that? But then she sees her friend Crystal [who has started seeing a therapist] who currently feels lighter, and happier, and different — and she decided well, is there more to it? I think the show did a really good job of this throughout. They’ll broach the topic, and then leave it in the ether; they wont pick sides, because we’re not preaching in the show. It’s conversation starters, like what do you think, or how do you think. Our characters handle it in a certain way, but the whole point — and a good point of TV and entertainment — is to open up conversations and ask you, deep down, how do you feel? …It helps people figure out why they think what they think, or where did this thought process come from. I think we did that a lot with the show — with therapy, with dating a guy who [had been with a man], or cheating — who was right, who was wrong, is there ever a right or wrong to cheating? We definitely had some conversation starters. HG: One of the many interesting things about the characterization of Molly is that her struggles with men are so nuanced. It’s so important for women to have high standards, like Molly does, but we also see instances of self-sabotage. Can you talk more about this difficult balance, and what you see as Molly’s mistakes in relationships? YO: I think whenever people give relationship advice, if it’s to someone who is still single at a certain age, it’s like “Maybe you should smile more?” Really — me not smiling? That’s why I’m still single? Or “Maybe you shouldn’t have such high standards.” No no no. I have two degrees, and I still owe student loans, so I am gonna have high standards because I paid for them… Also, who are standards high for? If they are met by somebody, then they’re not high for that person. They’re high for *you* because you can’t meet them. So who is to say what is high or low? Now, there are some issues that Molly did have in terms of self-sabotaging herself — not necessarily picking up on context clues or social norms. I think that is kind of like her fatal flaw. But I also feel like she’s so naive in that way because everything in her life is structured. Molly knows how to get a promotion — if I work late, if I do my job, if I’m a good lawyer, I can get promoted. The end. If I tell a guy I like him, and offer him something, that should mean that I want a relationship. But it doesn’t quite work like that on the relationship bit — I think she’s trying to bring what makes her successful as a professional into the relationship space, and that doesn’t always translate…There are so many unspoken rules. And I don’t think Molly knows how to navigate them. HG: What relationship advice would you give Molly if she was your friend? YO: I want to say take it slower, let it breathe, give it time. Almost, like, don’t want it so bad — but how do you tell someone not to want a relationship so bad? That makes no sense. But I would say slow it down…make sure that guy likes you at the same level you like him before bringing in other aspects of a relationship… And if you realize it’s not going anywhere at the pace you desire, then exit stage left. It’s okay to just be like, “You know what, this isn’t working out.” But I think Molly wants someone to like her — you like me! you like me! — but Molly, you have to like him too! If he’s not giving you what you want, then he’s not what you want. HG: I know you recently started the table reads for Season 2, and you probably need to keep it all under wraps. But is there anything you can tell us about what to expect for Molly this season? Is it really over for Molly and Jared? Has anything changed in her career? YO: I think a big thing for Season 2 is really self-discovery for everybody. I think the writers have done an amazing job as far as peeling back the layers and adding more depth to everybody’s story lines — really enlarging their worlds a little bit. Obviously we have two series regulars (Issa and Molly), and then we have their friends, Kelly and Tiffany. Even delving into the dynamics of those four women — that’s gonna be super fun, super interesting…Maybe we’re gonna see how they all became friends, what their relationships really look like. I definitely think the show is still called Insecure for a reason, and everyone is battling their insecurities — or at least coming to terms with their insecurities, and figuring out what that means and figuring out how to function…So I think for Season 2, we’ll see everyone have a moment. In Season 1, Episode 1, Issa starts out saying “I’m a almost 30, and I just need to figure out my life. I need to get it right.” And by the time we leave all the characters at the end of Episode 8, there’s a lot of figuring out that needs to happen…Like when Molly is in the car and says, “I don’t know how to get that right,” and Issa says, “Well I’ll be here with you while you try to get it right.” I think everybody’s trying to process and figure it out. And hopefully there will be some wins along the way. I certainly hope so, for my own sake. Can Molly just have a good relationship with somebody that loves her?! Please, that’s all I ask for…The comments from the fan’s last season — they were just like, can Molly get a win ’cause this is hard to watch. And I’m like, I’m right there with y’all! I want the same thing for her! (laughs) We’ll see — I’ll be figuring it out with you all. HG: The friendship between Issa and Molly is so beautiful, hilarious, and complicated, and the pairing is so meaningful to fans. When you were growing up, were there any female friendships in pop culture that you felt that you could connect to in this way, as much as there is a lack of diversity in the characters we see? YO: You know, growing up, I didn’t have many friends because I was bullied. And I didn’t really watch a lot of TV ’cause I’m an immigrant and my parents were like “Study your books” — so I was like, okay! I have one job! But shows that I really gravitated towards were Living Single, A Different World, Girlfriends. So I saw black women interact, and even though it was different than what I was experiencing or going through… it was like, oh, this kinda seems fun! This is how they talk about issues! This is what a college relationship looks like! Those were kind of the influences on my psyche. As far as dope female relationships, for me, I think I saw them and they were so much older than me — I was watching Doug, so I was like “Doug and Patti Mayonnaise are great!” (laughs) I was more like The Wonder Years — that was more my speed. That and cartoons, I was affected by my cartoons. As a kid, those were the things that motivated me. HG: I saw that earlier this month for International Women’s Day, you were on a diversity panel about entertainment. How’d that go? YO: It was phenomenal! I was on the panel with the writer of Thelma & Louise (Callie Khouri) — which is like, oh my God, you’re a legend. That was so inspirational. [Thelma & Louise] was the first thing she wrote, and then she got an Oscar for it. And you’re just like (gasp) GOALS. It was also just beautiful on International Women’s Day to be on the panel with all these women from different aspects of the industry. We had a composer — and you don’t really see that many female composers for films. We had the executive director of Women in Film (Kirsten Schaffer), and we were talking to an audience of mostly women. Any time women gather, you can just feel the empowerment and the honesty. In the Q&A, [women asked about] what happens in those moments when you have doubt? And that’s such a real thing. Sometimes, we have doubts. Our show is called Insecure because even if you’re killing it one aspect, you’re probably insecure in another aspect. Are you ever whole, complete, and lacking nothing? Sometimes you are, and sometimes you’re not, and its okay because you’re now in a safe space to even be able to ask that question and get an honest response back. I love those kinds of panels because it’s real and authentic and inspiring, and at the same time, it’s comforting. HG: In addition to your amazing work on Insecure, you’re also a stand-up comedian and had a web series, First Gen. Do you have any projects coming up that put you back into that creator role? YO: Yes! So First Gen — we released it on the web, but it was never meant to be a web series. It was kind of a teaser trailer of what could be; it was like a concept trailer. We’re still developing that…Hopefully after we wrap, we can maybe take it to market. I’m really passionate about immigrant stories — especially now when the climate is so anti-immigrant…Let’s show what it really means to be an immigrant battling old world and new world views, and where you fit in this dichotomy. I’m excited to see where that could live and what I could do with that. I’m still doing stand-up, and we start filming Insecure on April 3rd…so I can’t do too much before we start, but I’m excited to get back, and also excited to pursue some other things. And hopefully after we wrap, I really do want to sink my teeth into a really awesome feature project. I’m looking for that now. My goal for this year is can’t stop, wont stop. I’ve had enough days off, so let’s keep working while we can! The first season of “Insecure” is available on Blu-ray and DVD on March 21st, and the second season premieres on HBO July 23rd!